Welcome to Kemmerer, Diamondville, and Frontier, where the spirit of the frontier lives on. Hollywood called it the Wild West. The real pioneers came to Kemmerer, Diamondville, and Frontier and built a community with their bare hands. 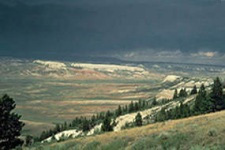 Our ancestors came to the western part of Wyoming by wagon train, on horseback and on foot. They came to dig coal out of the hills and work the land. They came alone and built a community by themselves. That community and the frontier spirit that created it is thriving.